Welcome to Sawdust City LLC! What is a Dry Sink? Ships in 2 business days. The newest addition to our popular Wood Tilt-Out Trash Bins is based off our #74 - Small Wood Trash Bin, but we've added an interior shelf for more storage! With our tilt-out design, the top of the trash bin stays stationary, and makes this the perfect office waste paper bin, or bathroom garbage bin. In the office, the top surface matches a standard desk height to provide a bit more work space. Sturdy wood construction means you can easily place a printer on top, and an extra ream of paper can be stored on the interior shelf. 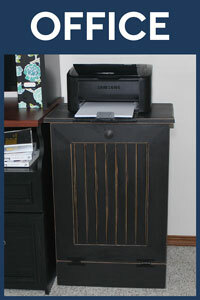 This compact piece of office furniture keeps your office garbage can handy but well-hidden! 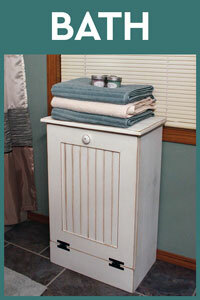 In the bathroom, use the interior shelf to store a few hand towels, washcloths, or misc. toiletries. Place decorative or useful items on top, or consider adding our 3-Shelf Top Hutch or 4-Shelf Top Hutch to make a bathroom cabinet with even more storage! 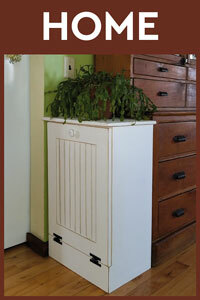 The small size of this piece makes it a perfect trash bin for small spaces. 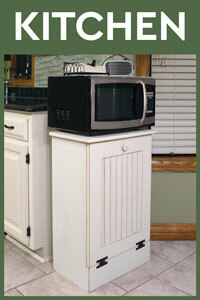 Sawdust City Tilt-Out Trash Bins do not use highly processed wood. The final look and finish is intended to be rustic and aged, with visible knots and other minor imperfections. Our OLD FINISH is a single coat of flat paint with distressed edges, for a warm aged feel. 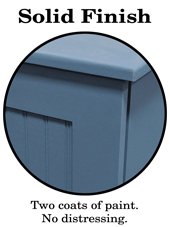 Our SOLID FINISH provides a more clean and modern look with two coats of flat paint and no distressing, but it is not like a veneer. We do our best to represent colors accurately, but viewing screens vary from one to another, and from real life. If you'd like to order a set of color chips, please call 800-717-3031. Absolutely love the trash bin. It is perfect. The wood work is flawless. Could not be happier. Doggone It - Lucky Dog - Three Dog Night - etc.